« Show your support for “Give me 3” – Contact your local Assembly Member today! Sharrows are good. So lets do them! Before the end of this year, LADOT will be installing approximately 20 miles of sharrows on L.A. streets. Sharrows are the most practical solution to close gaps between existing facilities on streets that cannot easily accommodate bike lanes. 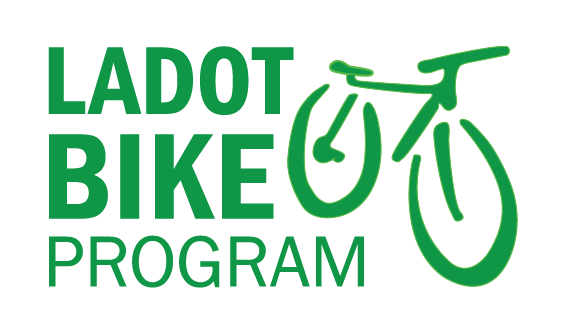 They will be used in conjunction with the “Bikes May Use Full Lane” sign (once it is approved by the CTCDC) to drill home the message that bikes are entitled to full use of the travel lane. Where do you put a Sharrow? The CA MUTCD requires that sharrows be placed at a minimum of 11 feet from the curb and must be present in conjunction with on-street parking, on a street with a posted speed limit not to exceed 35 mph. Sharrows must also be placed immediately following an intersection (in conjunction with parking) and should be spaced no more than 250 ft apart. The City of Los Angeles will be placing sharrows no less than 12 feet from the curb, per the recommendation of our sharrow study. LADOT is looking to roll out Sharrows throughout the City to fill in gaps between existing facilities, on streets that cannot easily accommodate bike lanes. Below is a list of facilities that will be getting sharrows. This list represents approximately 20 miles of bike infrastructure that will be going into the ground before the year’s end. Tell us what you think in the comments section below. 1.4 Miles from Wilshire Blvd. to Arden Pl. 0.05 miles from Arden Blvd. to Rossmore Ave.
1.4 miles from Melrose Ave. to Yucca St.
0.2 miles from Cahuenga Blvd. to Vine St.
1.5 miles from La Brea Ave. to Bronson Ave.
0.4 miles from Van Ness Ave. to Western Ave.
0.1 miles from Bronson Ave. to Van Ness Ave.
0.04 miles from La Mirada Ave. to Fountain Ave.
0.06 miles from La Mirada Ave. to Fountain Ave.
0.6 miles from Hamlin St. to Oxnard St.
0.3 miles from Ballona Creek Bike Path to Culver Blvd. 0.9 miles from Manning Ave. to Monte Mar Dr.
0.7 miles from Venice Blvd to National Blvd. 0.4 miles from Sunrise Ridge Rd. to San Fernando Rd. 0.5 miles from 4th St. to Cesar E. Chavez Ave.
4.4 miles from 98th St. to Martin Luther King Jr. Blvd. 2.6 miles from Hoover St. to Long Beach Ave.
1.75 miles from Vermont Ave. to Clovis Ave.
1.5 miles from San Fernando Rd. to Foothill Blvd. Show some photos of unaccompanied 8 and 80 year olds cycling on these streets and I will believe that sharrows actually work. I’d be great to see some on Barrington Ave. and Veteran Ave. in West L.A.
There’s a serious lack of good North-South bike routes on the westside. I ride the 4th street sharrows daily and am glad to hear that there are a bunch more coming relatively soon. These seem to help close some significant gaps in cycling infrastructure. I’m not sure if there’s been any discussion of this yet, but Silverlake Blvd. could really use some sharrows for the few-block stretch between Sunset (where the bike lane ends) and the 101 (where Silver Lake Blvd. becomes Beverly and where there a number of quiet residential streets that provide a safe route that isn’t heavily trafficked). Those few blocks of Silverlake Blvd. have some pretty fast traffic and two lanes (plus parking) in each direction and don’t look too suitable for bike lanes, but I get a lot of honking, tailgating, close passes, etc. on a regular basis there. Sharrows might help. Sharrows are needed on Ohio Avenue between Westgate and Kelton Avenue. If a 50,000 student population doesn’t warrant them, I don’t know what would. @Aaron: I agree, Silver Lake Blvd. south of Sunset is pretty sketchy for cyclists, and badly in need of repaving. However, I think instead of adding sharrows, it would make sense to just extend the road diet (with bike lanes) through to Beverly, and then continue these new lanes along Beverly (at least a few blocks to the Red Line at Vermont). There is a middle school right where SLB terminates, so the city might even be eligible for “safe routes to school” funds. Yes – according to the city bike plan, that area (Silver Lake Blvd below Sunset) will have bike lanes within the “5-year implementation plan” – so please no sharrows where the bike plan designates bike lanes. Thank you for compiling the data and moving this project forward. In my experience, sharrows can work well on 2 lane streets where bike lanes aren’t really an option (i.e. Fountain). But I think the speed limit on these “bike friendly” streets should be lowered to 25mph so cars are passing cyclists at safer speeds. Also, I don’t agree with adding sharrows to busy 4 lane streets (such as Vine), and I suspect many cyclists will continue to ride on the sidewalk for fear of their lives. is there a complete map with ALL of these locations? Of course you’re right that a road diet would be even better, but seeing as how this stretch doesn’t appear on any of the contemplated lanes in the Bike Plan, I guess I’m assuming that sort of treatment would be years away at best and setting my sights a little lower and hoping for some sort of treatment to make this dangerous stretch that I ride daily a little more inviting. It’s the one serious gap in my commute (and the connection of a lot of people in Silverlake/Echo Park/Atwater/etc. heading down the Wilshire corridor) between some fairly good lanes in upper Silverlake Boulevard and the 4th Street sharrows. It would be very disingenuous and off-putting if the city tried to count unfinished projects toward the 40-mile implementation promised. The Google map for Arden Blvd. from “Wilshire Blvd. to Arden Pl.” shows the route on N. Rossmore Ave. rather than Arden Blvd. Thanks for catching that. We have corrected the link. The sharrows are a first step to recognizing that bicycling is a true transportation option for the City of Los Angeles. But bicycle Boulevards and bike lanes would make for safer road ways for bicyclists and pedestrians. I’m hopeful motorists will start respecting bicyclists on the street by seeing more and more bicycle facilities’ on the road and then recognize bicyclist have the same right to be on the road as cars. I’ve, read the new bike plan and if the City Council truly supports this plan, LA will have very good bicycle facilities on the road. Please keep pushing the bicycle agenda forward from the inside and I will continue to write the mayor and city council members. Together we will make a positive change for bicyclists in the City of Los Angeles. As a resident of Motor Ave, the most logical improvement would be a standard road diet from National to Venice, with bike lanes and a center turn lane. Motor is a textbook-case LA quasi-arterial with 2 lanes in each direction and no center turn lane. Traffic volumes are light and most (if not all) delays are the result of people making left turns from the number one lane. The biggest danger to bicyclists I see on a regular basis is from cars swerving from the number 1 to number 2 lanes to avoid left turners ahead. Given that Motor north of National was already put on a road diet with bike lanes some years ago, extending that configuration south is the optimal solution. Sharrows would then be appropriate south of Venice to Washington where the right-of-way is narrower. I would be extremely disappointed if sharrows are implemented as a substitute for a true road diet. As the Motor project moves forward, I’d be happy to do on-the-ground outreach in my neighborhood. Please keep my posted when the timing is right. Los Angeles, CA 90034) and I’m sure they would be supportive. 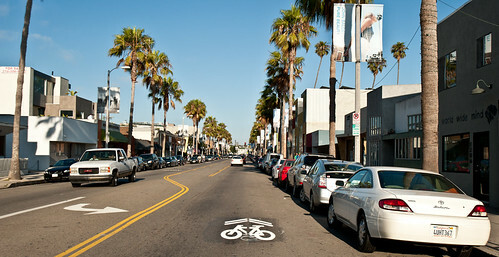 It also creates a network effect since it would connect to the Venice Blvd. bike lanes. I like sharrows! They are like bike lanes big enough for cars to fit in them. For car traffic to properly ‘share’ a lane with bicycles they must drive at the same speed as bicycles, which is less than half of the suggested 35 MPH speed limit. Posting 15 MPH speed limits on sharrow lanes will help motorists understand how to use these streets. Slower speeds give motorists the ample reaction time they need on new dynamic streets, and decreasing the force of collisions will greatly enhance safety as well. Bicyclists want the ‘sharrow’ symbol to indicate a safe place to ride! I live in the valley and I use the Reseda sharrow corridor all the time, now and they are perfect for me. The cool thing most cars slowed down and passed me safely with the sharrows in place. So in my book the sharrows work, I glad the pilot program showed that and the city is putting more in. As I said the more motorists see bicycle facilities on the street the safer the roadways will be for bicyclists. Give me a sharrow any day if I can’t have a bike lane! I’m assuming that all of these streets that are to get Sharrows are designated as bicycle friendly streets on the bike plan. There is a wide difference in traffic per lane between them judging from a street level view for three of them on Google Maps. Of the three streets, Arden Blvd has the strongest possibility of being made into a true bicycle friendly street using Sharrows. It’s a residential street that has speed bump signs stating 15 miles an hour. Fountain Ave would need to have, at the minimum, protected bike lanes to come close to being a bicycle friendly street. There is far too much traffic on these two lanes for bikes to be 12 feet out from the curb, with only Sharrows to protect the rider, which would really just be riding in mixed traffic on a busy street. Take a street level look with Google Maps to see what I mean. There is no conceivable way to make this a trully bicycle friendly street without a buffer zone and physicial barrier. Sharrows will simply not increase the bicycling much beyond the fearless, young adult male. Hoover St. from Manchester Ave to Martin Luther King Blvd is mainly a four lane road with parking on both sides. How this can get Sharrows instead of bike lanes is hard to fathom with a street this wide. I can’t imagine many people riding in front of cars where the Sharrows will be on this street. The Sharrows will simply not make it comfortable enough for many to ride in the street here. According to the Bike Plan, a bicycle friendly street gets a minimum of four treatments, Sharrows, signage and two types of traffic calming. Even Arden Blvd would only be half-way there to fitting this definition of bicycle friendly with Sharrows added to the existing speed bumps. I can’t wait for the Dutch experts to get here, right now I sometimes feel like I’m on a island with some of my ideas on what it takes to make bicycling comfortable for most people. We need to take the perspective of subjective safety on much of this. What will the potential end user think about it and will they use it? If few, if any, people make use of the improvements, then what is the point of spending resources on it. Dennis – Overall good points, but one clarification – re: “all of these streets that are to get Sharrows are designated as bicycle friendly streets on the bike plan” – true for only 7 of 22 on this DOT sharrow list: McConnell, Breed, Mott, Hoover, 51st, Colden, and Astoria. Summarizing: Bike lanes will fit easily on Arden Pl, Yucca, and McConnell. Bike lanes will fit easily on significant parts of Fountain, Bronson, State, 51st and Colden. How will sharrows work with time-based parking restrictions on Vine and Hoover? on October 22, 2012 at 6:43 pm | Reply Bike Report Card for FY11-12: Overall A- « B.I.K.A.S.